February 11, 2015 Alumni, Faculty & Staff, President Comments are disabled after 182 days. A new sculpture visually honoring the art of collaboration and the service of Pennsylvania College of Technology President Davie Jane Gilmour graces a wall in the Student & Administrative Services Center. Created by Gilmour’s husband, Frederick T. Gilmour, a professional artist, retired college employee and alumnus, the 23-foot metal sculpture was recently installed on the third floor of the campus building, near the college’s executive offices. “Collaboration,” a 23-foot metal sculpture honoring the service of Penn College President Davie Jane Gilmour, graces a wall in the Student & Administrative Services Center on the college campus. The art piece was commissioned in 2008 by then-Board of Directors Chairman Robert E. Dunham, now chairman emeritus, to recognize and commemorate President Gilmour’s 10th anniversary at the college’s helm. “Collaboration” is a fabricated piece using chromed aluminum tubing, clear and colored Plexiglas mirror, and texturized aluminum sheet. “Collaboration” is the third sculpture created by Fred Gilmour on display on campus. The other two are: “Interface,” a stainless steel centerpiece in the college’s Remembrance Garden, and “I’ll Be There In a Minute,” a mobile hanging in the atrium of The Gallery at Penn College. The artist also has other mixed-media works displayed on campus as part of the college’s Art on Campus initiative. Fred Gilmour studied technical illustration at the college’s predecessors, Williamsport Technical Institute and Williamsport Area Community College, and received a bachelor’s degree in art education from Mansfield University. 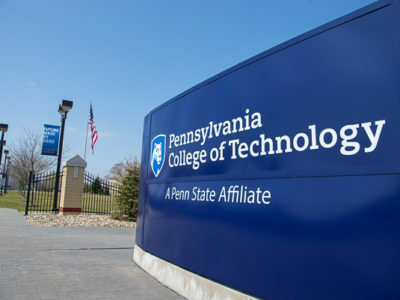 He retired from Penn College in 2001 after 20 years of service, holding such positions as director of instructional technology and distance learning, assistant professor of advertising art, and executive director of the Penn College Foundation.